Model T Ford Forum: OT - The Henry. Model T Ford Forum: Forum 2013: OT - The Henry. Been looking at 22's and i just bought a Henry.Smooth action,big loop lever,Walnut stock and forearm. Best of all Made in USA!!Bud. I have wanted a Henry for years. I bought one 4 years ago. Sure lowered the number of squirrels. Nice quality at a great price. 22 is about the only ammo I can afford to shoot without concern anymore. Have seen ads for these rifles and wondered about them. Glad to hear they are a quality item being made here. Gosh ,,,now I want one..I've been looking at those for four-five years...I heard they are one of the best quality rifles you can buy...I'm not really a Gun Guy ,but it would be fun to plunk tin cans with...You planted a seed....Carl in the SoCal Mtns. I agree with Keith. I like CB's for use in town on squirrels with a back stop and the ability to use long rifle ammo in the same rifle when hunting slightly bigger game. I think if it shoots as good as it looks i may get a golden boy in .357 next year.Bud. I have a .17 HMR Henry. It is deadly accurate. As a bonus, I can still buy ammo for it. Around here, it is nearly impossible to buy .22 ammo. Lack of .22 ammo availability has been a real problem for me the couple of years in NJ/PA. The common response I get from the store clerk is; you can check on Wednesdays around 10AM for an ammo deliver but it will be sold out within 10 minutes if there is one. Sound familiar? Last year I got one in 30/30 the neat thing about it is the cartage is loaded just like a .22,in the bottom of the feed tube. I have my Grandfather's Model 1876 45/60 Winchester and i have some org brass but replacement's are shortened 45/70 brass.Maby a 45/70 might also come this way.Bud. No problem buying 22 ammo here in Texas. Can't find 45/60 easily though. My grandfather had an 1876 Winchester that he bought new. Wish I had it now. I had a Henry Golden Boy Rocky Mountain Elk Foundation Commemorative .22 Great little gun. I recently took it to an auction and sold it with the intention of buying a standard Golden Boy .22 and a .17 with the money. Didn't quite get enough to buy both but pretty close. I'm waiting for the local gun dealer to get a couple Golden Boys in so I can pick the one I want. I like that they are made in AMERICA instead of Brazil or someplace. I have had a Henry .22 for the past several years and it has turned into one of my favorite .22's. Bud - I have a Winchester 25-20 I have been unable to find brass. 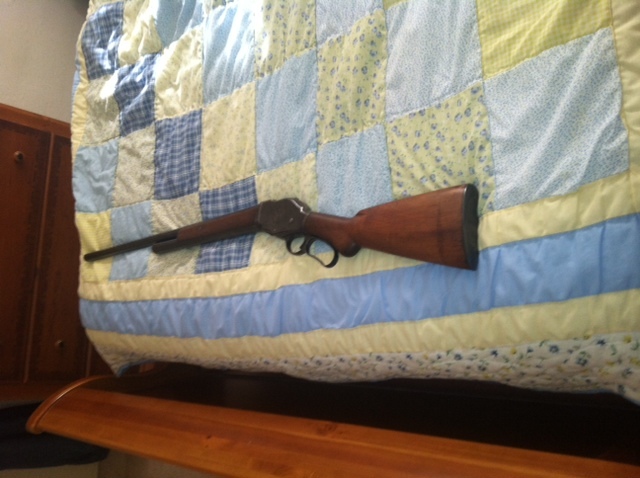 Also I have an 1887 Winchester Lever Action 12 gauge 2 5/8" chamber. I can cut down 2 3/4" cases to work here. 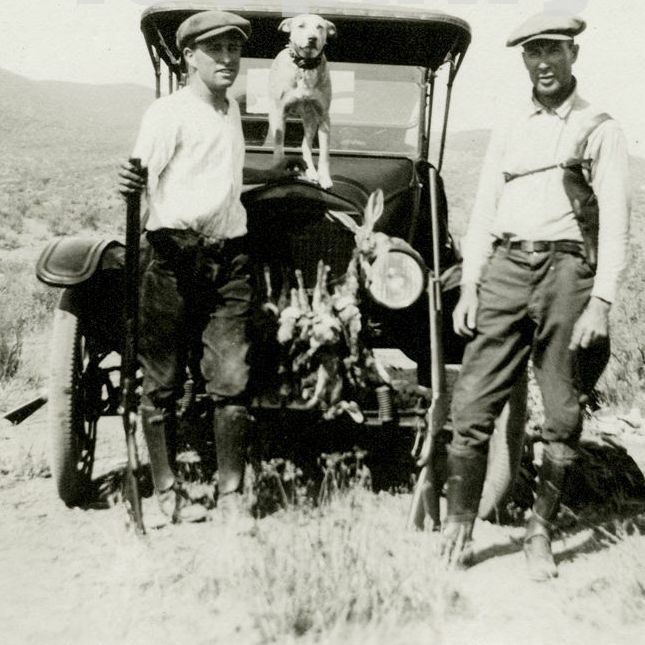 This shot was posted a few days ago with the guy on the right using an 1887 Winchester for rabbits. I looked at those a few months ago to buy for my grandson. Because he is only 8 I bought him a little single shot cricket. Not much of a gun but when he gets a couple years into it I intend to buy him a Henry. He loves going to the shooting range with me and he is a pretty good shot. Wouldn't it be nice if our schools had a program that made every 6th grader take gun safety and teach them that there are responsible gun owners out there. Make them all shoot 100 rounds of 22 both the boys and the girls. Teach them to treasure and respect our rights rather than willfully surrendering them. A long lost cousen of mine used to deer hunt with a 25/20 but it's been 50 years since i'v seen him or it.Do you use brass shells in the1887? ?.I have seen 3 1876 45/60's but both of the others were [sporters] with short mags? Bud. Bud - I do have some brass shells but I have made some plastics that work fine. Strangely enough, one of the highest scoring whitetails (the Jordan buck) was shot near me with a 25-20. Still, it seems mighty under-powered for deer...particularly a big one. I think I would rather stick to the .338 Federal in my Ruger Hawkeye. It's USA made as well. Lots of smack down without a lot of recoil. My aging shoulder appreciates that. I used a 270 for most of my deer hunting but have taken several with a 22-250. .22LR is great if you can find ammo for it. Lot of places are all out. I love my Ruger .22 TD. George - What's a "TD"? I'm not George but just so you don't lose any sleep over it tonight........... TD = take down. In other words you can break the rifle down to two parts. Go Hawks! I like plinkin' to. Got an old 30-40 Craig that isn't worth nothing even though it is in beautiful condition. Kinda fun shooting an 117 year old rifle. It's older than my T's! Got an old Remington single shot bolt action .22 my father gave me when I was a boy. It was old then. Used to put venison on the table with it. Got a newer Ruger .22 that holds 10 rounds that I use to keep 'possums and racoons out of the yard. Oh... and a 20 gauge for crows that think they own my cherries. Got some home defense stuff to. Used to be a lot of meth labs out this way. Don't know of any left.